Industry experts say that toroidal transformers are small in size and are typically used when there is a need for a transformer that offers low magnetic resistance. So, if you are looking for a transformer that will provide you value for money from the beginning till the end of its life cycle, try considering a toroidal transformer for your application. Why Should You Use a Toroidal Transformer? Below find a list detailing the important advantages of a toroidal transformer in comparison to a conventional transformer. 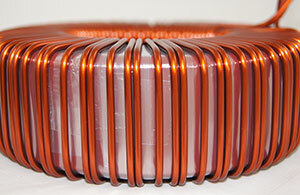 Toroidal transformer manufacturers keep certain things in mind and design a unique configuration which provides maximum containment of magnetic fields without interrupting overall efficiency. The toroidal transformer core is created with a minimum raw material. The weight and size of this transformer are affected due to high packing density. As per the power rating, one can reach up to 50% weight reduction. Toroidal transformers can be mounted easily using just a screw due to which the assembly time gets reduced significantly. This even reduces maintenance, repair and replacement-related down time. One can even use different mounting options like using enclosures or capsuling in a plastic container. If the standard size of a toroidal transformer doesn’t fit in your application, you can vary the core dimensions with ease. You can have an extreme flat transformer design for your low profile equipment. If we speak of conventional transformers, they are mostly constructed using two individual core parts. Joining these parts result in small air gaps due to which magnetic stray field arises. Whereas, in the toroidal transformer, there is no such air gap, so these emit a very low magnetic interference field. This property makes it useful in critical applications like audio electronics and medical equipment. The core of a conventional transformer is formed by two individual parts of stacked silicon steel sheets. All these parts have loose sheet ends which cause the transformer to vibrate resulting in producing disturbing hum. On the other hand, the core of a toroidal transformer is made up from a long strip of silicon steel which is tightly wound to give it a toroidal shape. Consequently, it results in a virtually hum-less transformer. A toroidal transformer sees very less iron losses which makes the magnetizing current much lower than a conventional transformer. Ultimately, this makes a toroidal transformer very efficient. If we compare the operations and specifications of a toroidal transformer with a similar conventional one, we will realize that they ensure low operating temperatures. Given the benefits that these toroidal transformers offer, one can have complete value for money. Toroidal transformers, thus can be incorporated and customized with features benefitting your application. You will see lesser downtime and a higher return on investment which makes it a popular choice in several applications.